Macular degeneration is the leading cause of impaired reading or detailed vision. The center portion of the retina, the macula, breaks down, and loss of vision occurs. This condition causes distortion in the central field of vision; peripheral (side) vision is not damaged. Macular degeneration is most often a result of the normal aging process. As we age, retinal tissue breaks down, and gradual deterioration causes loss of function of the macular. In a small percentage of cases, macular degeneration is compounded by the leakage of blood vessels that nourish the retina. Scar tissue and new abnormal vessels grow. Leakage from these new vessels is common, causing blurred and distorted vision. This dense scar tissue formation can have several effects on the central vision. Injury or some types of infection may also cause macular degeneration. In addition, genetics may play a role, as the condition may also be hereditary. 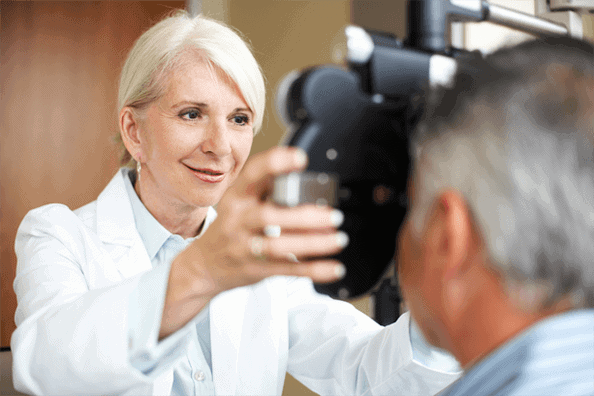 Who Should be Checked for Macular Degeneration? Distorted central vision that causes trouble with ordinary activities such as reading, driving, etc. Blurry words on a written page, distortion of lines, or dark areas in the center of vision are all symptoms to be aware of. Fading of color vision. Side vision is not affected, as there is never a total loss of sight. This condition often causes the good eye to compensate for the bad eye, if only one eye is involved. In turn, this compensation often disguises the symptoms of the disease. How Do You Test for Macular Degeneration? Examination of the back of your eye. Your eye doctor will put drops in your eyes to dilate them and use a special instrument to examine the back of your eye. He or she will look for a mottled appearance that’s caused by drusen – yellow deposits that form under the retina. People with macular degeneration often have many drusen. Test for defects in the center of your vision. During an eye examination, your eye doctor may use an Amsler grid or a visual field analyzer to test for defects in the center of your vision. Macular degeneration may cause some of the straight lines in the grid to look faded, broken, or distorted. Fluorescein angiography. During this test, your doctor injects a colored dye into you’re a vein in your arm. The dye travels to and highlights the blood vessels in your eye. A special camera takes several pictures as the dye travels through the blood vessels. The images will show if you have abnormal blood vessel or retinal changes. Optical coherence tomography. This noninvasive imaging test displays detailed cross-sectional images of the retina. It identifies areas of retina thinning, thickening, or swelling. These can be caused my fluid accumulations from leaking blood vessels in and under your retina.